Western blot analysis of whole cell lysates probed with USP2 antibody followed by detection with HRP conjugated Goat anti Rabbit IgG antibody (1/10,000, STAR208P) and visualized on the ChemiDoc™ MP with 5 second exposure. Arrow points to USP2 (molecular weight 80 kDa). Rabbit anti-human USP2 antibody recognizes ubiquitin carboxyl-terminal hydrolase 2, also known as 41 kDa ubiquitin-specific protease, deubiquitinating enzyme 2, ubiquitin specific protease 12, ubiquitin specific protease 9 or ubiquitin thioesterase 2. Rabbit anti Human USP2 antibody recognizes USP2 ealso known as ubiquitin carboxyl-terminal hydrolase 2, 41 kDa ubiquitin-specific protease, deubiquitinating enzyme 2, ubiquitin specific protease 12, ubiquitin specific protease 9, ubiquitin thioesterase 2 or ubiquitin-specific-processing protease 2. The USP2 gene encodes a member of the family of de-ubiquitinating enzymes, which belongs to the peptidase C19 superfamily. The encoded protein is a ubiquitin-specific protease required for TNF-alpha -induced NF-kB signaling. This protein deubiquitinates polyubiquitinated target proteins such as fatty acid synthase, murine double minute 2 (MDM2), MDM4/MDMX and cyclin D1. MDM2 and MDM4 are negative regulators of the p53 tumor suppressor and cyclin D1 is required for cell cycle G1/S transition. Multiple alternatively spliced transcript variants encoding different isoforms have been identified (provided by RefSeq, Aug 2011). 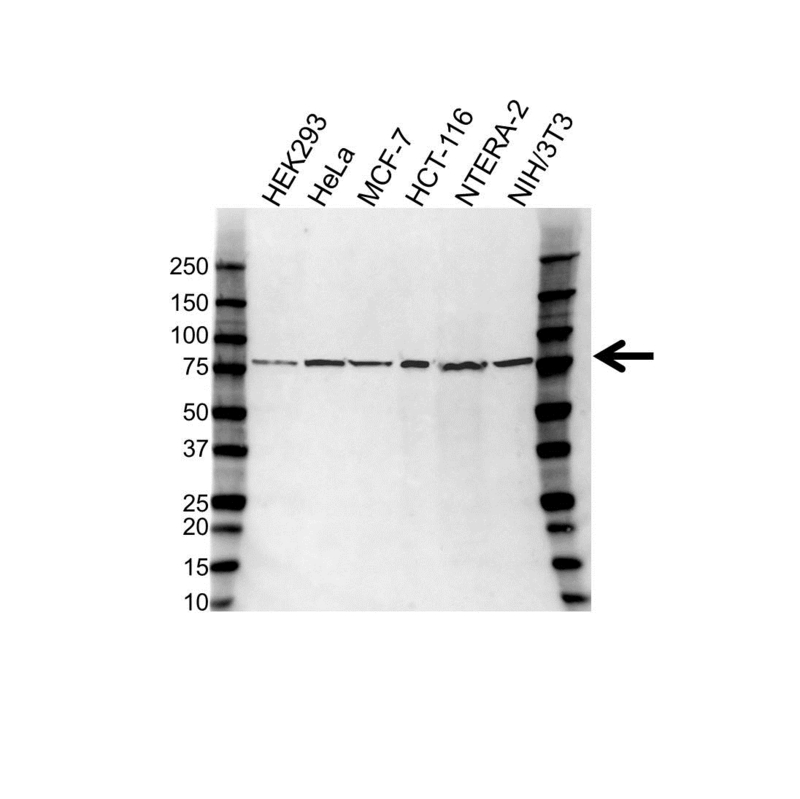 Rabbit anti Human USP2 antibody detects a band of 80 kDa. The antibody has been extensively validated for western blotting using whole cell lysates. Anti USP2 detects a band of approximately 80 kDa in HCT116 cell lysates.